Seeing Barbara's extraordinary beauty, Dioscorus decided to hide her from the eyes of strangers. Therefore, he built a tower for Barbara, where only her pagan teachers were allowed to see her. From the tower there was a view of hills stretching into the distance. By day she was able to gaze upon the wooded hills, the swiftly flowing rivers, and the meadows covered with a mottled blanket of flowers; by night the harmonious and majestic vault of the heavens twinkled and provided a spectacle of inexpressible beauty. Soon the virgin began to ask herself questions about the First Cause and Creator of so harmonious and splendid a world. The fame of her beauty spread throughout the city, and many sought her hand in marriage. But despite the entreaties of her father, she refused all of them. Barbara warned her father that his persistence might end tragically and separate them forever. Dioscorus decided that the temperament of his daughter had been affected by her life of seclusion. He therefore permitted her to leave the tower and gave her full freedom in her choice of friends and acquaintances. Thus Barbara met young Christian maidens in the city, and they taught her about the Creator of the world, about the Trinity, and about the Divine Logos. Through the Providence of God, a priest arrived in Heliopolis from Alexandria disguised as a merchant. After instructing her in the mysteries of the Christian Faith, he baptized Barbara, then returned to his own country. During this time a luxurious bathhouse was being built at the house of Dioscorus. By his orders the workers prepared to put two windows on the south side. But Barbara, taking advantage of her father's absence, asked them to make a third window, thereby forming a Trinity of light. On one of the walls of the bath-house Barbara traced a cross with her finger. The cross was deeply etched into the marble, as if by an iron instrument. Later, her footprints were imprinted on the stone steps of the bathhouse. The water of the bathhouse had great healing power. St. Simeon Metaphrastes (November 9) compared the bathhouse to the stream of Jordan and the Pool of Siloam, because by God's power, many miracles took place there. 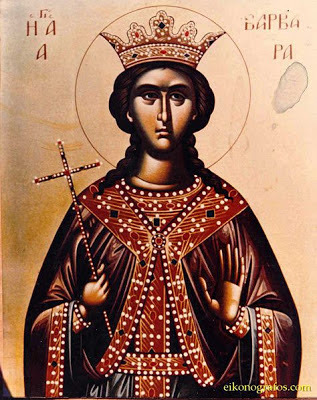 In the sixth century the relics of the holy Great Martyr Barbara were transferred to Constantinople. Six hundred years later, they were transferred to Kiev (July 11) by Barbara, the daughter of the Byzantine Emperor Alexius Comnenos, who married the Russian prince Michael Izyaslavich. They rest even now at Kiev's St Vladimir cathedral, where an Akathist to the saint is served each Tuesday. Many pious Orthodox Christians are in the habit of chanting the troparion of St. Barbara each day, recalling the Savior's promise to her that those who remembered her and her sufferings would be preserved from a sudden, unexpected death, and would not depart this life without benefit of the Holy Mysteries of Christ. Our venerable and God-bearing Father John of Damascus (c. 676 - December 5, 749) was also known as John Damascene, Chrysorrhoas, "streaming with gold," (i.e., the golden speaker). He was born and raised in Damascus, in all probability at the Monastery of Saint Sabbas (Mar Saba), South East of Jerusalem. His feast day in the Orthodox Church is December 4. He is also recognized as a saint in the Roman Catholic Church. Practically all the information concerning the life of John of Damascus available to us today has been through the records of John, Patriarch of Jerusalem. Though these notes have served as the single source of biographical information, dating back to the tenth century, these writings have been noted by scholars as having an exuberant lack of detail from a historical point of view and a bloated writing style. Although he was brought up under the Muslim rule of Damascus, this was not to affect his or his family's Christian faith or cause any grievances with the Muslim countrymen who held him in high esteem. To the extent that his father held a high hereditary public office with duties of chief financial officer for the caliph, Abdul Malekunder, apparently as head of the tax department for Syria. When John reached the age of twenty-three, his father sought out to find a Christian tutor who could provide the best education for his children available at the time. Records show that while spending some time in the market place John's father came across several captives, imprisoned as a result of a raid for prisoners of war that had taken place in the coasts of Italy. This man, a Sicilian monk by the name of Cosmas, turned out to be an erudite of great knowledge and wisdom. John's father arranged for the release of this man and appointed him tutor to his son. Under the instruction of Cosmas, John made great advances in fields of study such as music, astronomy and theology. According to his biographer, he soon equaled Diophantus in algebra and Euclid in geometry. In spite of his Christian background, his family held a high hereditary public office with the Moslem rulers of Damascus, led by caliph Abd al-Malik. He succeeded his father in his position upon his death; John de Damascene was made protosymbullus, or chief councilor of Damascus. It was around his term in office that burst of insurgence by the iconoclasts began to appear in the form of heresy, actions which disturbed the Church of the East. In 726, in disregard of the protests of Germanus, Patriarch of Constantinople, Emperor Leo the Isaurian issued his first edict against the veneration of images and their exhibition in public places. A talented writer and in the secure surroundings of the caliph's court, John de Damascene initiated his literary defense against the monarch in three Apologetic Treatises against those Decrying the Holy Images. This was the earliest of his works and the one which earned him a reputation. Not only did he attack the monarch, but his use of a simpler writing style brought the controversy to the common people, inciting revolt among those of Christian faith. Unable to punish the writer openly, Leo the Isaurian managed to get possession of a manuscript written and signed by John de Damascene, which he used to forge a letter from John to the Isaurian monarch offering to betray into his hands the city of Damascus. Despite John's earnest advocation to his innocence, the caliph dismissed his plea and discharged him from his post, ordering his right hand, which he used for writing, to be severed at the wrist. According to the tenth-century biography, his hand was miraculously restored after fervent prayer before an icon of the Virgin Mary. At this point the caliph is said to have been convinced of his innocence and inclined to reinstate him to his former office. However, John then retired to the Monastery of Saint Sabbas near Jerusalem, where he continued to produce a stream of commentaries, hymns and apologetic writings, including the Oktoechos (the Church's service book of eight tones) and An Exact Exposition of the Orthodox Faith, a summary of the dogmatic writings of the Early Church Fathers. He died in 749 as a revered Father of the Church and is now universally recognized as a saint.